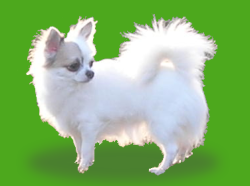 I am <?xml:namespace prefix = st1 ns = "urn:schemas-microsoft-com:office:smarttags" />Marina ,I am engaged in breeding the smallest dog, one of the ancient and mysterious in the world. I am fond of this breed . Clever, funny ,charming Chihuahua once came into my life. And are still there. My father has cultivated me love to animals since my childhood and I am gratefull for that. By the way, now they have Chihuahua from my nursery called Dolly ,which they adore very much. For all my life I have had dogs ,but I was not particular about any breed. But it happened that in 1997,august 10, I was offered a puppy Chihuahua from Moscow nursery ‘’NASVIT’’-Natalya Svirkina .I even hardly suspected that taking this puppy. I could love him with all my heart. It is really unique dog .And more I know this breed ,the more I convince that it is the best …Natalya revealed this breed for me and aroused great interest to take up breeding these dogs. I wish her success in all her deals .